This new commission you see here has been on my drawing board for at least a week now. A beautifully detailed photo was sent (Along with the deposit, lol) and, with the velour and pastels ready, `both soft and pencil pastels` away I went. After a lengthy discussion with the client, and personal visits regarding the colour, size requirements and composition, I got started. First (as always) I started on the eyes and the surrounding features. Next up was the muzzle (Whiskers and all) but this time I progressed differently! Whereas with ALL my other portraits I lay down a base colour all over the area that the face covers, this time I only worked on a small area at a time and I guess this may be because of the amount of wonderful detailing I was presented with. After-all….it`s the smallest of details that help to bring a portrait to life. Very few `Soft pastels` were used in this piece. 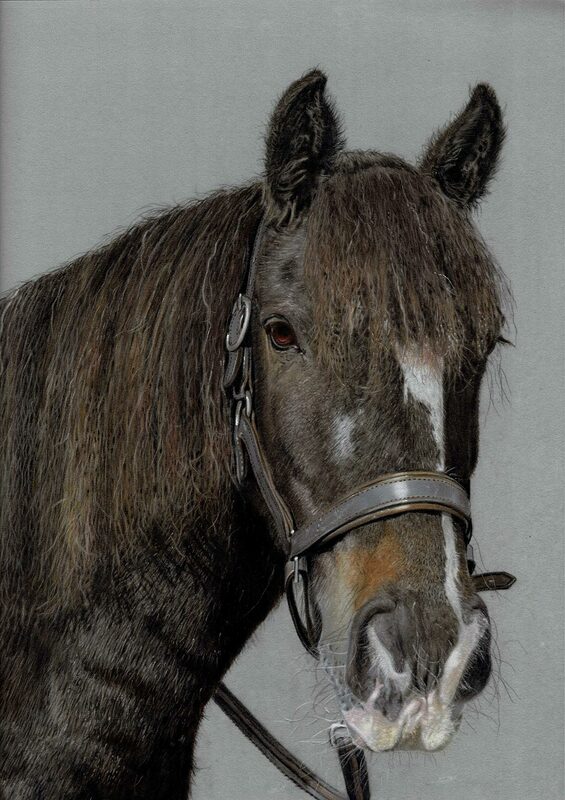 I laid down a small area of `Sepia` first and overlaid this with a sharp pointed sepia pencil and built up the layers with burnt umber and other colours to achieve the required finish, it`s all about layers when trying to achieve the hair or fur of an animal. Always…Always, try to keep your pastels sharp! This portrait is just about finished but next time I’ll post from the start of the portrait, see you soon.